The economics of obesity; the obesity of economics. By now we have all heard about the enormous economic impact of obesity. The direct costs include the money spent on the care and treatment of the myriad of medical conditions that are associated with obesity while the indirect costs are reflected in metrics such as absenteeism, presentism, decreased productivity and shortened life-spans. Those of us who have come to understand that this phenomenon is driven by global shifts in diet over recent decades are perplexed at the apparent incapacity of the mainstream practitioners of nutritional science to see the obvious. The paradigm of calories-in vs calories-out still dominates the consensus view on both the etiology of this epidemic and the prescription for its cure. Since I began speaking out about my own experience and the literature that supports LCHF, I have encountered dogmatic resistance from conventional nutritionists and dieticians to the degree that I am literally astonished when I don’t get that reaction. I recently tuned into a podcast of Dr William Davis, the author of “Wheatbelly”, a new book on low-carb eating that has recently become very popular (you can find the interview here: http://www.cbc.ca/thecurrent/episode/2011/10/10/wheat-belly/). Dr Davis, a preventive cardiologist, was being interviewed on CBC’s “The Current” and to counter his hypothesis that the genetic manipulation of wheat has led to food products that are harming us and are driving the obesity epidemic, they recruited a PhD nutritionist from the University of Saskatchewan. Now, I can see why they would want somebody from Saskatchewan as this is the major wheat producing region of Canada. And, since Dr Davis’ hypothesis is based on events that have occurred in the field of plant genetics, I think she was at a bit of a disadvantage. In any case, her points about low-carb diet were typical of the usual blather you get from that quarter. She began by characterizing this as the “Atkins meets Paleo” diet and then went on to mischaracterize low-carb diets as highly restrictive and completely dependent on the excess consumption of meat. These are old canards. The defenders of the status quo are forced to concede that a low-carb diet is effective for weight loss, because every study so far has demonstrated that, but they attribute this to its “highly restrictive” nature. In other words, you lose weight because you can’t find anything to eat, or anything that you want to eat. What rubbish! 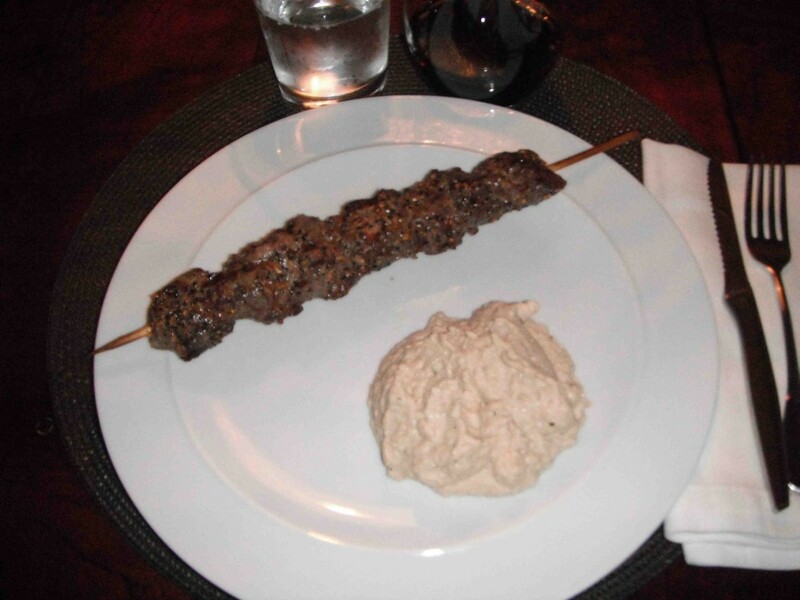 Just look at the photos of what I eat in the preceding posts to understand how ridiculous is that concept. Her parting comments were, “Move more, eat less. Wheat is not the enemy. Worry about overeating”. Great! That has been the mantra for the past forty years during which time the epidemics have accelerated. Einstein said the definition of insanity is doing the same thing over and over and expecting a different result. This is an esteemed PhD professor of nutrition at a Canadian university. Is it any wonder that we are in the fix we are in? I am an early to bed, early to rise kind of guy. In a household with young kids this is the best time to read. This Sunday morning I was up at 5:30 perusing some of the financial blogs while everyone else, except the cat, was still sleeping. I am fascinated with the world of economics, especially since we have witnessed such upheaval in that sphere over recent years. We were severely buffeted by these events and that jolted me into the realization that I knew virtually nothing about something that could have very important consequences for our family. Nature abhors a vacuum, so I now read broadly in this area. What I have learned leads me to the conclusion that, just as we have been led into a terrible fix with the obesity epidemic, we are being led astray, in a very bad way, economically, too. The paradigm that I have come to accept posits that the global financial sector has grown from a necessary but small part of a well-functioning capitalistic economy to a monstrous parasite that is sucking the life out of the real economy and will do so until both the host and the parasite are moribund. Consider that in prior periods, the proportion of business profits that went to the financial sector for the services they provide to the real economy was about 8%. By real economy, I mean the sectors that produce real wealth in the form of material goods like metals, food, manufactured products, etc. The complex economies that have arisen to support those wealth-generating activities rely on a financial sector which provides services to “lubricate” the functioning of the wealth producing sector. The financial sector doesn’t generate any real wealth. The profits that accrue there are skimmed from the wealth producers. Okay, so far so good. Unfortunately, what has happened over the past 30 or so years, is that the financial sector has grown from 8% to approximately 45% of corporate profit. This is an enormous distortion. Something changed to allow that to happen. It was not that they were providing more and better services since, if that were the case, you would expect the growth of the wealth producing sector would have continued apace and you would not see this kind of enormous shift. What did, in fact, happen is that the financial sector was able to capture the political and regulatory sectors and neutralize them in terms of the constraints that had been traditionally put on financial activities. Many of these constraints were established as a result of the Great Depression and had endured for decades during which time economies prospered. It is normal in a capitalist economy to have cycles of boom and bust. Some argue this is an essential and healthy feature. During booms, the appetite for risk-taking increases, productivity increases and the boundaries are pushed. When the boom comes to an end, the bust is the cathartic house-cleaning that resets the economy by clearing away the excessive risk-takers and the over-producers, and over-consumers, leaving in place those whose business strategies were the most sturdy and sustainable. Booms and busts can happen in any sector. Everyone remembers, for instance, the great dot-com boom and bust. In most of the world we are aware of a more recent real-estate boom and bust (we have been sheltered in Canada, so far). There was also the stock market boom and bust and then boom again, over the past three years. However, while these are what would normally be considered a cyclical series of events to be expected in an otherwise healthy economy, they actually have taken on a more ominous tone. Underlying the recent cycles is a manipulation of the credit markets of the world that has, in fact, driven this series of asset bubbles while, at the same time, ratcheting up the amount of credit in the system with each iteration of the cycle. Much of this is has been allowed to happen because of the work of economists from the “Chicago School” who believe in the inherent perfection of the market and the lack of any need for regulation. Alan Greenspan, the former US Federal Reserve Chairman, who presided over the inflation of a massive credit bubble over the past 30 years, was a high priest of this school of thought. It was he and some of his colleagues who were instrumental in dismantling the regulations that had constrained the financial sector since the Great Depression. They did so in the belief that the market would “self-regulate”. Consider that when credit accumulates, in other words when debt accumulates, it is the financial sector that profits. The inflation of an enormous credit bubble to drive those asset bubbles and serial booms and busts, ratcheted up the wealth, power and influence of the financial sector. Of course, the financial sector itself can experience booms and busts. Banks go under all the time in the US, for instance, and the FDIC was established to clean up when that happens and to protect the funds on deposit. The problem we have now, however, is the rise of the “Too Big To Fail” banks. These are institutions that are deemed to be so vital for economic survival that, if they were to be allowed to dissolve the way smaller banks are, it would cause irreparable harm to the economy. Therefore, taxpayer money is used to bail them out. How could a single bank be so important? It appears to me that it is because these large banks are interconnected to a degree that is at the same time vast and incomprehensible. Again, much of this is in the shadows precisely because of the interventions of Greenspan et al who successfully prevented open and public disclosure of how much risk banks were sharing with each other. This is the area known as “derivatives” and what some call the “shadow banking” sector. During the Clinton administration, Brooksley Born, the bright woman who ran the Commodities Future Trading Commission, proposed that her agency should start regulating the growing phenomenon of derivitives trading between these large institutions. Had that happened, most agree that the financial crisis would likely have been averted. Her reward: Greenspan, Ruben and Summers ganged up and had her literally run out of town. They then had legislation passed in the US Congress specifically preventing any regulation of this increasingly important banking activity. What the banks were doing, and have been allowed to continue to do, with derivatives is astounding. Banks have to maintain certain capital requirements in proportion to the amount of risk they are taking with loans and investments. While these ratios have been serially relaxed during the Greenspan years, the banks have figured out how to escape the restraints of even the looser requirements. They do this by buying “insurance” from other big institutions in the form of derivatives and credit default swaps. The toothless regulators accepted that buying insurance would be acceptable in place of actually having capital on hand. The banks wanted this to free up the maximum amount of capital for them to invest for profit. This would have been okay if the providers of the “insurance” were actually regulated like real insurance companies are regulated. In other words, if the counterparties to these “insurance” policies were able to actually pay out in the event of a big credit default, the large institution that bought the “insurance” would not be at risk of failing and would not require a government bailout. What actually happened is that the TBTF banks to a large extent insured each other. That’s a neat trick because it effectively reduces the cost of the insurance to zero. I pay you a premium for my insurance and you do the same for yours – wink, wink, nudge, nudge – while everybody knows that a payout would actually be impossible and, all the while, the regulators gave this sham their blessing. I read somewhere that 80% of this activity was between the top five major institutions. So, it turns out that, instead of insuring and diversifying risk by using these instruments, the large financial institutions actually guaranteed that they were too big to fail by interlocking their fate with that of the other big institutions. This problem of interlocking credit default swaps has not been addressed and is perhaps even worse now than it was when the big collapse happened in 2008. The reason? The banks like it that way. It allows them to gamble with the maximum amount of money from which they profit enormously while also insuring that, if they lose, they will get bailed out by their governments and taxpayers. This is what is known as “moral hazard”. This is the reason all eyes are on Europe at the moment where an inevitable default in Greek government bonds threatens to trigger a chain reaction throughout the financial systems of the large European economies and across the Atlantic into the US economy. All these shadow banking shenanigans have had the net effect of protecting the financial sector from the inevitable boom/bust cycle. They never go bust. When they are, in fact, bankrupt they get rule changes and bailouts from government to exempt them from the fate of any other type of business that gets over extended with malinvestment. Not only is this a travesty, but by kicking the inevitable default further down the road, it is driving the build-up of a much bigger calamity than what might have been the case were natural cyclical events allowed to run their course. Banks have been allowed to hide their bad debts thanks to a rule change by the Financial Accounting Standards Board which lets them mark their assets to fantasy rather than to what they are worth in today’s market. What was considered fraudulent behaviour prior to the financial crisis became permissible after thanks to the lobbying of major institutions. This is an example of the power that the financial sector now wields. When they are losing the game they are simply allowed to move the goal posts. They have turned into a cancer that will not die until it has killed the host. So, why am I ranting about the global financial system on a diet blog? It’s because I think the underpinnings of the global financial catastrophe and the obesity epidemic have similarities. I am talking about the paradigms upon which the systems are based. In the case of the financial crisis, it is the Chicago school and their beliefs in market perfection, minimal regulation and laissez-faire economics which led us down the garden path to the precipice we now find ourselves on. In the case of the obesity epidemic, it is the current calories-in/calories-out paradigm of the schools of nutritional science that have led us to the brink of disaster with the obesity and related epidemics. Both professions, the economists and nutritionists, and their respective institutes of higher learning have become bastions of defence of the status quo, impervious to paradigm shifting ideas whose validity is well established but convenient to ignore because they are orthogonal to the conventional wisdom. Both professions resemble priesthoods where one must first be indoctrinated and learn the catechisms and where one is rewarded for perpetuating and protecting the belief system from all manner of challengers no matter how well ensconced in evidence and reality they might be. In my opinion, this is what we saw with the nutrition professor from Saskatchewan in her defence of the status quo in the face of Dr Davis’ new challenge. In the field of economics, we saw another example this last week when the (faux) Nobel prize was awarded to one of the architects of the theories that inform the Chicago School. In both areas, there are rewards aplenty for those who toe the line – professorships, consulting fees, jobs with industry and even Nobel prizes. And, in both cases, there is little reward for being a heretic, no matter how right you might be. I have added some more photos of typical dinners at our house. It’s hard to do the photos since my wife thinks I have gone off the deep end and my eleven year old son does his best to interfere. Anyway, enjoy! 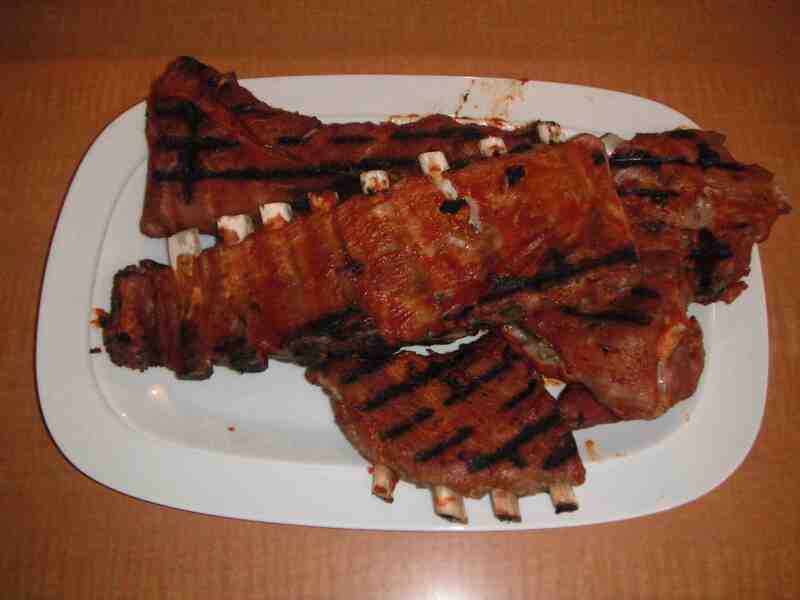 A plate of ribs fresh off the BBQ. The sauce is chinese chilli sauce, soya sauce, liquid smoke, rice vinegar, worcestershire sauce, garlic powder. It’s salted and then done in the oven at 225F for three hours wrapped in foil and then put on the BBQ with sauce added. 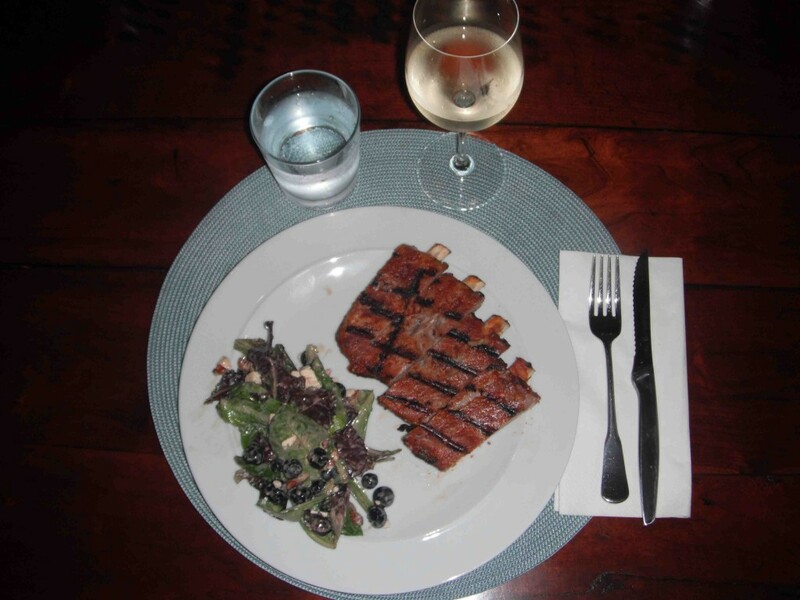 A portion of ribs served with a salad of mixed greens, blueberries, chopped pecans and feta cheese with balsamic vinaigrette. 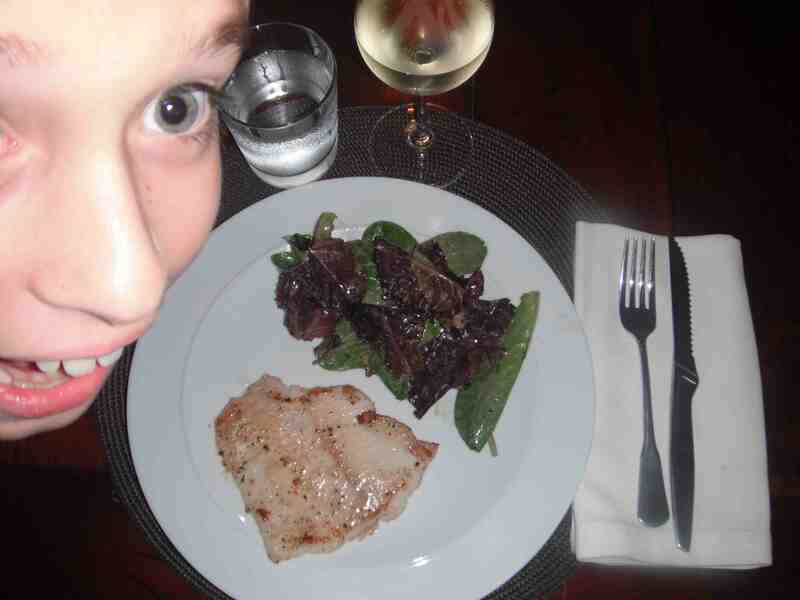 Filet of sole fried in butter and garlic, served with salad of greens and balsamic vinaigrette and photo-bomb. This is a piece of white chinook salmon marinated in a light teriyaki sauce and done on the BBQ. 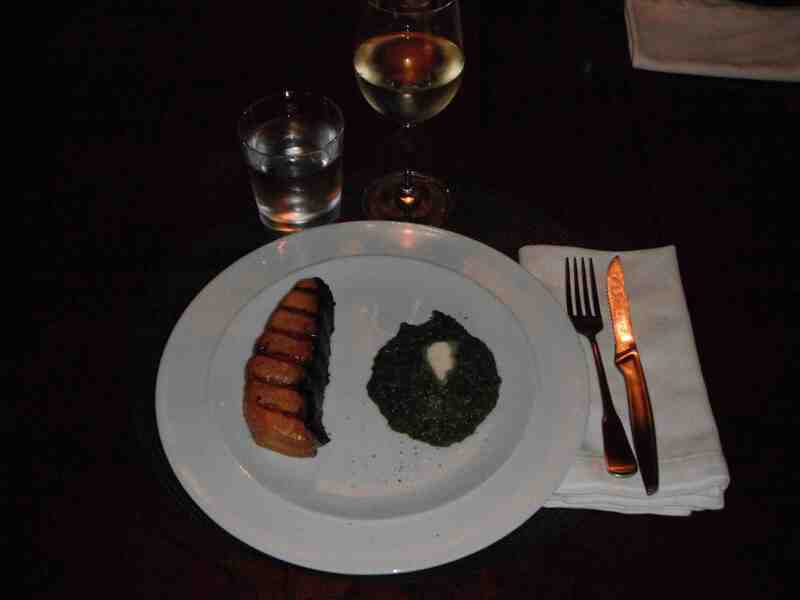 It is accompanied by a spinach puree. A skewer of beef that has been drizzled with olive oil and sprinkled with Montreal steak spice before grilling on the BBQ. It is accompanied by faux mashed potatoes made with cauliflower and mushrooms.